As you may have noticed, I’ve posted a lot about this campaign over the past day or so. The reason: my Adventures in Middle-earth campaign is starting up again (after a 5-month hiatus). I’ve been going through my notes and trying to organize them. It’s surprising how many things I’ve forgotten about since we started up over a year ago! In an attempt to get (somewhat) organized, I’ll create a single ‘index’ and ‘log’ for the campaign. 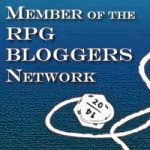 This index will join a few others that I’ve posted here for my games over the years (the links to which can be found in the upper-right corner of the blog). It should be posted in a few days. The log will include summaries for each adventure. These will be a few sentences long each. Unfortunately, I don’t have the time or energy to keep writing up ‘complete’ recaps for each adventure. The one’s I’ve already posted will stay up, of course, but I probably will not be doing any more, except perhaps for the final adventure in this campaign storyline (given its importance). The agents of Thal Eolsen are successful in their inquiries, and the merchant provides Ulvmund with the location of his ancestral home. 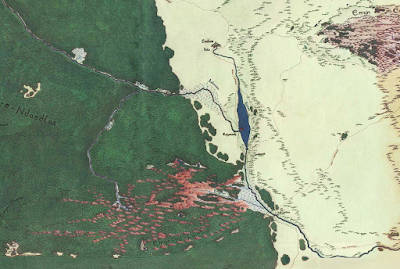 The Galmund fiefdom was located about 90 miles northwest of Dale. 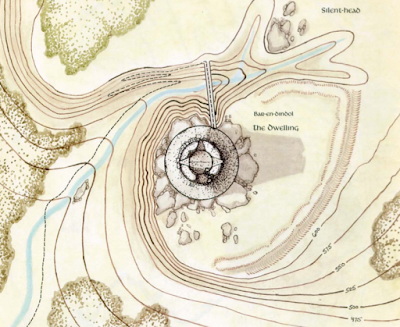 The family’s ancient tower was located atop a hill that overlooked a small lake, near the ‘Grey Road’—the Men-i-Mithrin—which runs north of Mirkwood (it once connected Dale and Lake-town to the dwarven holds of the Grey Mountains). The tower was called ‘Bar-en-Dindol’, which means ‘dwelling at the silent head’ in Sindarin (it was named by the first Lady to dwell at the tower, who hailed originally from Gondor and thus was fluent in the elvish tongue). Excited by this news, Ulvmund implores his companions to help him investigate his family’s ancient land and stronghold. Hengil and Hartmut agree, so long as the companions then travel to the Anduin Vale and transport the malevolent black orb to the wizard Radagast. The companions journey to Dale, and then onwards to the Galmund ruins. En route, on a grey and misty day, the company spots a rider in the distance. The rider does not approach the party, but instead gestures to the northwest; he then rides away, disappearing into the mists. 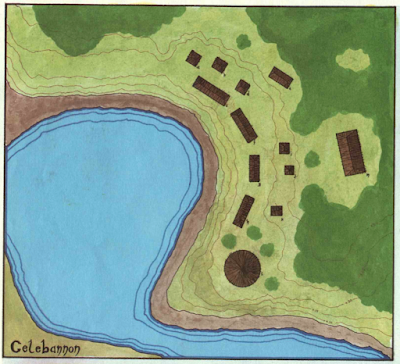 Eventually the companions reach the ancient land of the Galmund family: the small lake, village, hill, and tower. Unsurprisingly, the village and tower are ruins, though the main floor of the tower remains largely intact. Within the tower, the companions discover some wargs (survivors, no doubt, of the Battle of the Five Armies). They defeat two of the vile creatures, but Ulvmund is knocked unconscious, and an especially large and vicious warg escapes to the north. Ulvmund sees the tower of his family as it must have looked two centuries ago. Made of firm, clean stones, carefully mortared and smooth, the tower reaches into the sky for a hundred feet. It is a bright spear in the grim Marches. Bright eyed Northmen stand on the top, looking toward the dolorous peaks of the Grey Mountains. Below the Silent-Head hill, stretching along the small Quiet Lake, is a hamlet of farmers and fishers. The peace and beauty of the scene is shattered when a black shadow passes over the tower and hamlet. The dragon has come! Smaug, for a malevolent reason known only to himself, desires to extend his desolation far beyond the ruined cities of Dale and Erebor. The wooden buildings of the hamlet erupt in flame; the villagers are all slain to a child. The great tower is not spared: with claw and fire, its upper reaches are destroyed. The guardsmen, servants, and other inhabitants are reduced to ashes or plummet to their deaths. Once the lands about the Silent-Head hill have been blasted, the dragon moves on to wreak destruction elsewhere. The vivid nightmare concludes, and Ulvmund awakens in a cold sweat. Standing before Ulvmund’s prone body is the translucent image of his ancestor, Lord Alaric. With an expression of great sadness, makes a gesture that Ulvmund understands to symbolize a well. The ghost then points to the southeast from the well. Finally, as he begins to fade, Alaric points directly at Ulmund and nods. After a few seconds the image disappears. Were it not for its vividness and detail, Ulvmund would swear that he was still dreaming. Following the instructions given by Lord Alaric, the companions discover a tunnel and three skeletons (the fleeing members of the Galmund family). The Galmund family sword is recovered. Having been crafted by the dwarves of ancient Erebor, the blade remains in excellent condition despite its many decades of neglect. 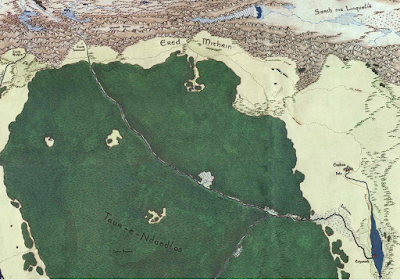 The next day the companions depart along the Men-i-Mithrin (“Grey Road”). Ulvmund Galmund vows to return someday, though, to rebuild and resettle his family’s demesne. Hengil spends much of July and August meditating and studying some of the ancient texts of the elves [healing corruption caused by the black orb]. He also decides, with advice from Luinwen, that the black orb should be taken someplace west of Mirkwood for safekeeping—either to Radagast the Brown, Saruman the White, or Galadriel of Lothlórien. Radagast is selected by the company, as he is closest. 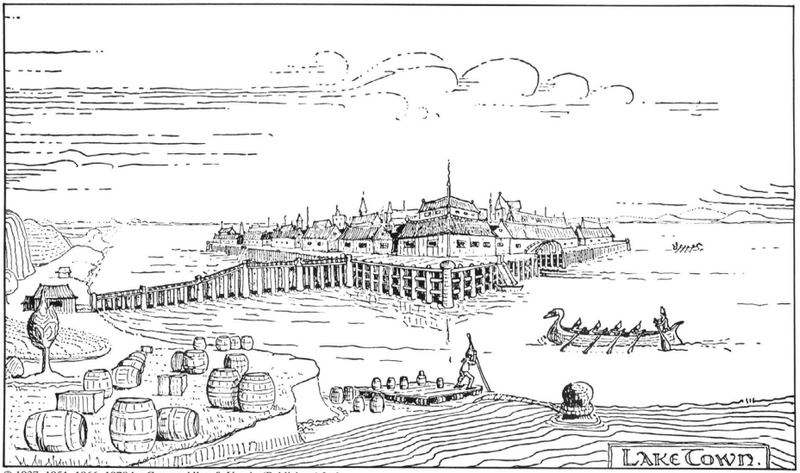 The companions leave Esgaroth with a caravan of four barges. The barges push up the Celduin River to trade with the Wood Elves. After 4 days of travel, the floating caravan reaches the Wood Elf town of Celebannon. 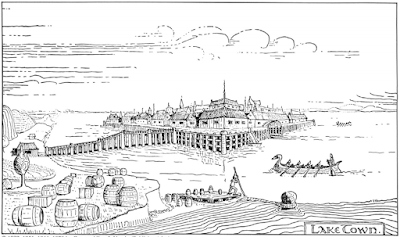 The companions go to the only inn in town—‘Dindraug’—where they learn from the Elven traders that the spiders of Mirkwood have become more active in recent years, since the disappearance of the Necromancer. The forest goblins, on the other hand, have become less active during the same period. Hengil visits the Sindarin scholar Luinwen’s abode. He asks the scholar to help him learn more about the black orb. She agrees, but tells the Dúnedan that it will take her several days of research. Rothaar One-Leg, a scout and warrior in the employ of the Lake-town merchant Thal Eolsen, arrives at Dindraug early in the morning. He meets the party and informs them that his caravan has been ambushed by a band of goblins, working with a large creature. He does not know what the large creature is, as he was not with the caravan at the time of the ambush; instead, he was scouting the trail ahead of the caravan, and discovered the dead guards and wagon ruins upon his return. 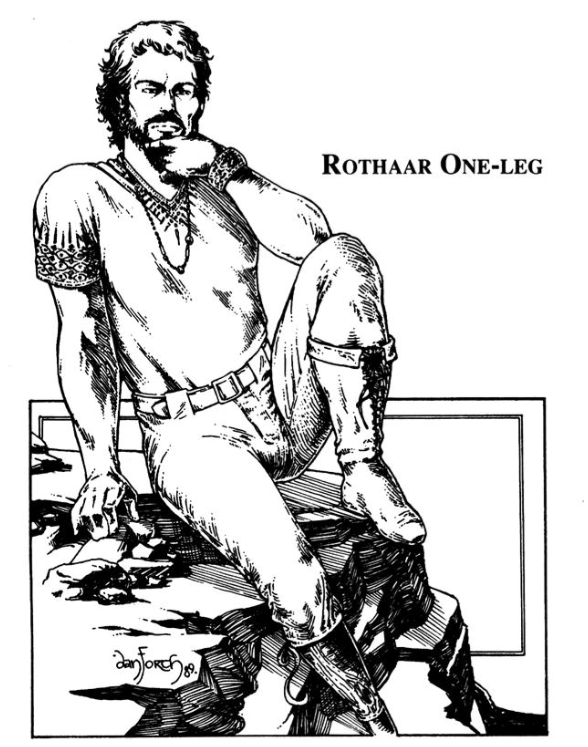 Rothaar believes that the goblins have taken at least one guard prisoner, as well as the loot from the wagon. The companions agree to help Rothaar, as does a young (rather eager and naïve) elf hunter named Galen. After Rothaar rests for a few hours and the heroes prepare themselves, the party departs Celebannon, heading southwest along the Elf-path. In the late afternoon (June 22nd) the party reaches the ambush site. Hartmut identifies the tracks of the mysterious ‘large creature’ as those of a hill troll; the others belong to forest goblins. The beorning then leads the party to one of the hidden rest spots known to him in the region. The next day Hartmut and Galen follow the tracks to small clearing; within the clearing, halfway up a rough hill, they two spot a dismal cave. The party convenes at the edge of the clearing; they spy a goblin lurking near the entrance to the cave. Hengil sneaks up to a bush halfway to the hill. There he makes a pheasant sound to draw out the goblin guard. The goblin leaves to investigate; it is promptly shot and slain by Hartmut and Ulvmund. The company then approaches the cave. Alas, their attempt at stealth fails miserably, as the goblins inside are alerted and they ask the party something in the grotesque Orcish tongue. Unable to answer, the companions charge in to confront their nemeses. After a brief combat, the goblins flee further into the caves. The vile creatures are pursued—eventually a terrible struggle ensues. 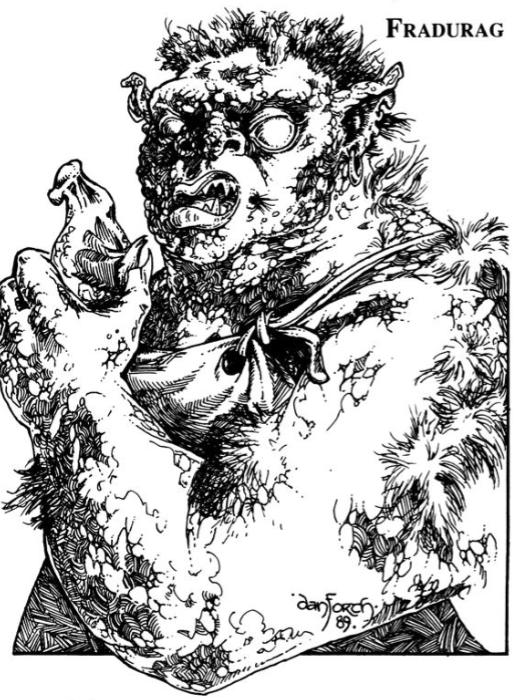 The goblins are promptly joined by a massive troll, which quickly knocks poor Galen unconscious. With his mighty axe, however, Hartmut manages to chop the troll to death. Following the desperate mêlée, the party discovers a concealed ‘chimney’—clogged with webs—that leads up and out of the cavern complex. Ulvmund also discovers a kind of ‘saddle’ strapped to the back of the troll. The companions deduce that the saddle is designed to enable a large spider to ‘ride’ the troll as a kind of mount—fortunately, and to the relief of all, there is no sign of the spider itself. After some careful exploration, Hartmut uncovers a finely crafted locked box—the prized possession of the merchant Thal Eolsen, taken from the caravan. Rothaar promises the party that the merchant will reward them greatly for the box’s return. The party returns to Hartmut’s safe-hold and camps for the night. The following day they journey to Celebannon. During their trip, though, Ulvmund senses that the group is being followed. The Dale-man’s intuition is vindicated when Hartmut spots some spiders following them within the trees. Upon being discovered, the spiders retreat further into the forest. The party, badly battered by their fight with the goblins and troll, elect to return to the elven village rather than pursue the spiders. A cloak of darkness she wove about them when Melkor and Ungoliant set forth: an Unlight, in which things seemed to be no more, and which eyes could not pierce for it was void. Upon the mountain-top dark Ungoliant lay; and she made a ladder of woven ropes and cast it down, and Melkor climbed upon it … Then Melkor laughed aloud, and leapt swiftly down the long western slopes; and Ungoliant was at his side, and her darkness covered him. And in that very hour Melkor and Ungoliant came hastening over the fields of Valinor, as the shadow of a black cloud upon the wind fleets over the sunlit earth; and they came before the green mound Ezellohar. Then the Unlight of Ungoliant rose up even to the roots of the Trees, and Melkor sprang upon the mound; and with his black spear he smote each Tree to its core, wounded them deep, and their sap poured forth. But Ungoliant sucked it up, and going then from Tree to Tree she set her black beak to their wounds, till they were drained; and the poison of Death that was in her went into their tissues and withered them, root, branch, and leaf; and they died. And still she thirsted, and going to the Wells of Varda drank them dry; but Ungoliant belched forth black vapours as she drank, and swelled to a shape so vast and hideous that Melkor was afraid. Hartmut then tell Luinwen—and the other companions—of his past encounter with the ‘spider cult’. The party bids farewell to Luinwen and Galen, and returns to Esgaroth with Rothaar. Having completed their first adventure together, our heroes—Hartmut, Hengil, and Ulvmund—spend some time resting in Lake-town. The companions take the locked chest (which they had discovered within the spidiers’ mound) to Aelfwine, a skilled locksmith in Esgaroth. Within the chest are revealed 2 Dwarven coins and 2 gems (aquamarine and moonstone). Hartmut asks some dwarves in town for more information about the chest. 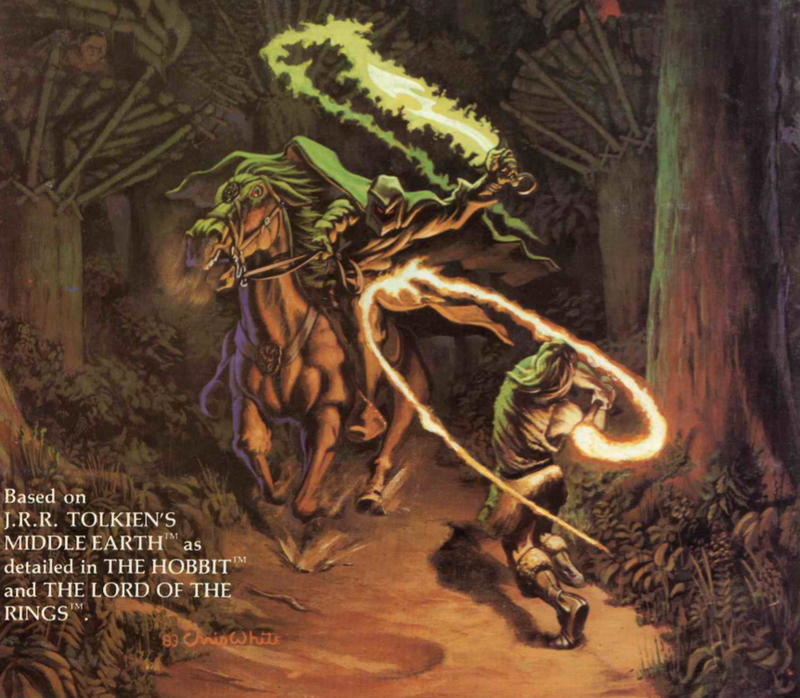 He discovers from them that it is likely from Moria (before its fall to the Balrog). Hengil researches the black stone. He learns that the etchings on it say (in a corrupted form of Quenya): “Submit to the glory of the Unlight!” Hengil also learns that the stone is likely from the Mountains of Mirkwood, where ‘black glass’ is common. Finally, Hengil is told that an Elvish sage in the village of Celebannon, named ‘Luinwen’, may know more about the stone and the meaning of what is written on it. Ulvmund researches the spiders of Mirkwood. He learns that there are at least 2 different kinds of spiders: ‘attercops’ and the larger ‘great spiders’. Moreover, these giant spiders are intelligent and can speak the mannish tongue. While evil, though, the spiders are not servants of the Necromancer (but have been known to cooperate with the Necromancer’s minions from time to time). The companions make plans to travel to Celebannon in the Woodland Realm to learn more about the black stone. This Vox video that explains Dungeons & Dragons (and, to some extent, role-playing games more generally) is pretty good. I especially liked the discussion by the participants about why they play the game (8:00-9:40). Next time I'm asked by a non-RPGer to explain the hobby that has been a disturbingly large part of my life since the age of 10, I may simply refer them to this video. New settings for Dungeons and Dragons 5e? It looks like some new settings for Dungeons & Dragons 5th edition will be announced by Wizards of the Coast later this year ("Dungeons & Dragons plans to announce several additional publications in 2018 which will add new campaign settings for players outside of the Forgotten Realms"). Personally, I'd love a 5e version of Planescape. It's my favourite 'official' setting ever published by TSR (though, tragically, I've never run or played in a pen-and-paper campaign). It is, I think, the most 'uniquely AD&D' setting ever -- it's 'mythology' in rooted in AD&D's distinctive, weird cosmology (the plethora of planes and their relations to each other), as well drawing heavily on singular AD&D creatures like the Githyanki, Tieflings, and so forth. 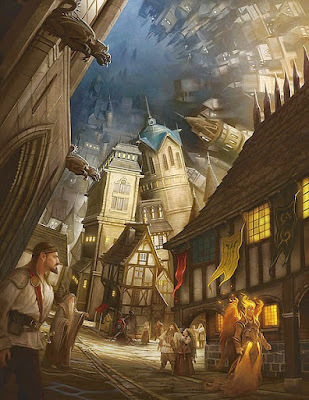 I appreciate its strange mix of being a hub within a Moorcockian multiverse (and its associated 'law-versus-chaos' factionalism), and its gritty proto-steampunk aesthetic (I'm not a huge fan of steampunk generally, but I like the way it is expressed in the look and ethos of Planescape). Also, thanks to the presence of so many portals ('doors') to other planes, it's easy to connect Sigil to other D&D worlds. So I really hope that this happens! 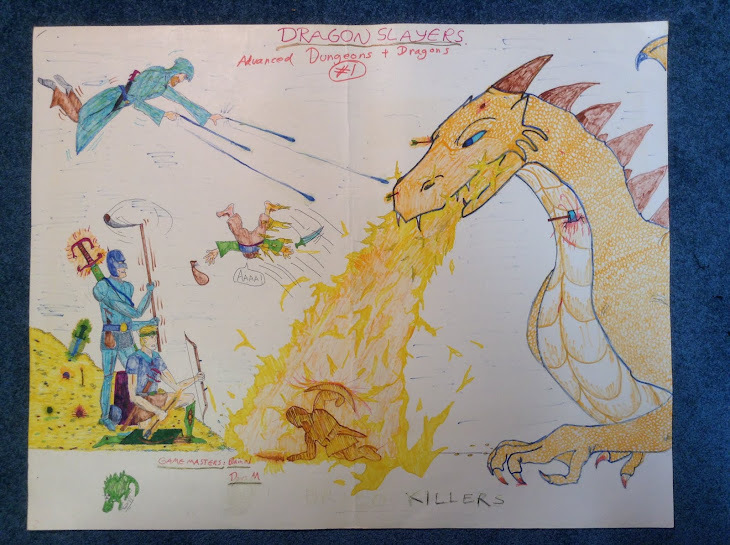 As for other old TSR settings, I suspect that Mystara (which I used to really dig, but find a bit too 'goofy' these days) and Greyhawk are just too similar to the Forgotten Realms to be done again with full-blown campaign books. Yes, I know that the fans can spell out many 'important' differences among these settings, but from a distance they're all 'kitchen sink D&D' worlds'. Not that there's anything wrong with that! But WotC already has FR. I'm not that familiar with Spelljammer. It never grabbed me back in the day. But I'd have an open mind to it, if a new version were to be published. Likewise I would consider checking out a 5e version of Dark Sun, which always struck me as quite intriguing, but I never picked up for some reason during 1990s. Among the more recent settings, I don't know much about Eberron, but it looks distinctive and I would consider looking into it as well, should a 5e version be produced.